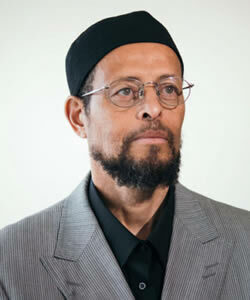 Imam Zaid Shakir is a faculty member at Zaytuna College in California, teaching Islamic history and politics. He is also a co-founder of New Islamic Directions and the Lighthouse Mosque. An African-American convert to Islam, he previously served in the U.S. Air Force and studied Arabic in Cairo. He worked for several years as an imam and community organizer in Connecticut before pursuing Islamic studies in Syria and Morocco. His publications include Where I'm Coming From: The Year In Review (2010) and Scattered Pictures: Reflections of An American Muslim (2005). Shakir earned a B.A. in international relations from American University and an M.A. in political science from Rutgers University. Shakir was one of the signatories in October 2007 of A Common Word Between Us and You, an open letter addressed to Christian leaders in an appeal for peace and cooperation between the two world religions.